Historically, newspapers successfully employed a revenue model of print advertising and home delivery subscriptions. Unfortunately, this dual-revenue strategy is no longer a viable method to keep newspapers afloat. Digital advertising is dominated by two players – Facebook and Google – and most local news has failed to attract the subscription success enjoyed by publications with a national, or even international, audience like The New York Times and Financial Times. In a new analysis, “Experiments and future models for digital news subscriptions,” the American Press Institute examines digital newspaper subscriptions in the U.S. to understand subscription costs and strategies. 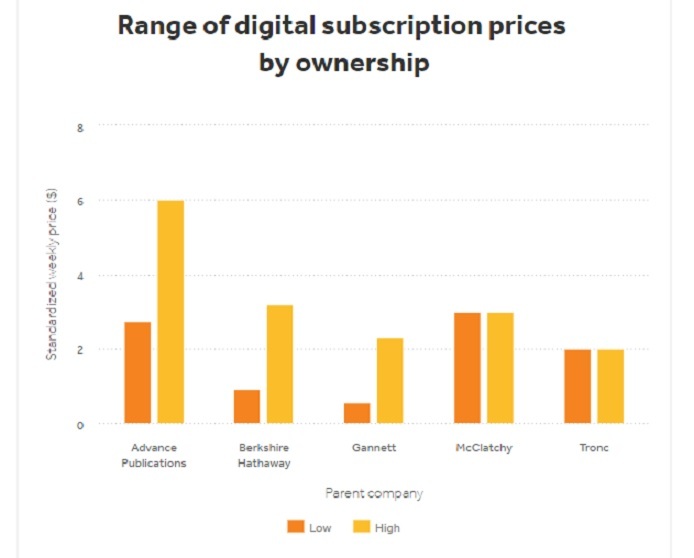 The research assesses subscription pricing by evaluating market size, circulation, and newspaper ownership. It’s important to note that digital content access includes but is not limited to websites, mobile applications, print newspaper copies, or e-editions. The results are based on 100 U.S.-based legacy newspapers; each based in one of Nielsen’s 100 largest designated market areas (DMA). 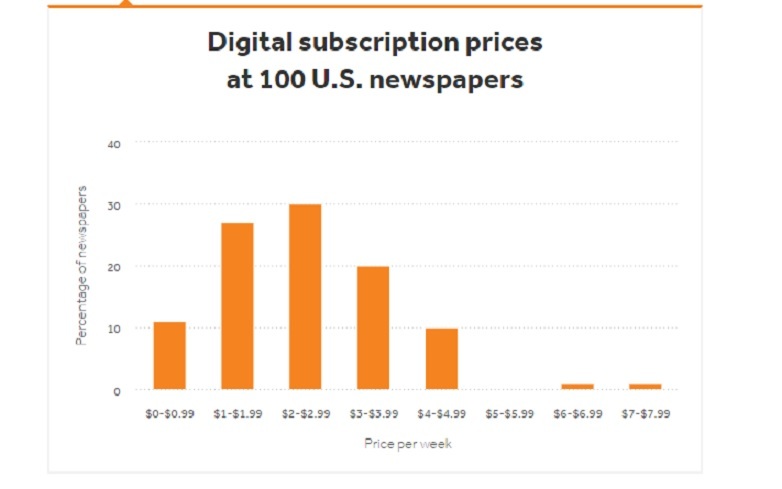 The median weekly price is $2.31 or $10 per month and $120 per year for a digital news subscription. Most subscriptions fall between $1 and $3 per week. The new median weekly price of $2.31 is 83% higher ($1.05 more per week) than what was reported in the 2012 Reynolds Journalism Institute research. The median weekly price is also 221% higher ($1.59 more per week) than respondents stated they were willing to pay in the same Reynolds Journalism Institute research. Four key factors in setting digital subscription pricing include market testing, corporate set price, industry norms and competitor pricing. Market size and circulation do not show a correlation to subscription price. However, ownership does, as prices are often standardized across some companies’ media properties. Discounted trial subscriptions result in higher conversion rates than do free trial subscriptions. It appears that some sort of initial payment information entry is helpful in converting discounted trials to paid subscriptions. Subscriptions offer include an array of perks from access to comments and fewer advertisements to improved browsing experiences and rewards programs. There are also offerings that include “insider-only” perks such as newsroom tours, movie screenings and exclusive giveaways. Partnerships offerings are also popular. The Washington Post partners with Hulu to offer combined digital access to The Post and Hulu for $99 a year. The New York Times has a partnership with Spotify Premium for combined access for $203.88 for the year. After news publishers capture the most loyal readers willing to pay for digital access, they need to secure the next segment of users who are not as easily convinced. This is when consumers need to be actively and individually converted to pay for a digital subscription. News organization must continually test new and unique offerings to attract new subscribers.